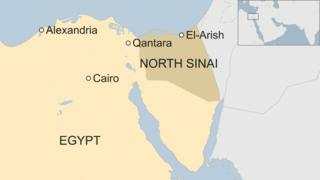 At least 18 policemen have been killed in an attack on a convoy in Egypt's Sinai peninsula claimed by so-called Islamic State, security sources say. Militants detonated a roadside bomb near the town of el-Arish, reportedly destroying three armoured vehicles and a fourth with signal-jamming equipment. The interior ministry confirmed there had been an attack and that several policemen had been killed or injured. Hundreds of soldiers and police have been killed by militants affiliated to IS since 2013, when the Egyptian military overthrew Islamist President Mohammed Morsi. The jihadists have also killed dozens of people in attacks targeting Egypt's Coptic Christian minority elsewhere in the country, and claimed it planted the bomb that brought down a plane carrying tourists in Sinai in 2015, killing 224 people on board. In Monday's attack, the police convoy was travelling along the road between el-Arish and Qantara when a suspect vehicle tried to break through it, according to an interior ministry statement. "When police forces dealt with the vehicle, it exploded and caused damages to the patrol's vehicles," it added. "This was followed by a shootout between the police officers and the terrorists, resulting in the death and injury of several policemen." It did not provide any casualty figures, but the attack appears to have been the deadliest on security forces in Sinai since July, when at least 23 soldiers were killed in a suicide car bombing that targeted a checkpoint near the Gaza border. IS claimed it was behind the attack via its news agency Amaq. It comes a day after the interior ministry said security forces had killed 10 suspected militants in a shootout during a raid on two apartments in Cairo. Investigators had received information about militants travelling from northern Sinai to the capital to prepare for attacks on neighbouring provinces, it added.